Photo: A sunset with the caption, "Ten Things of Thankful"
The Christian world is celebrating Easter on Sunday. No matter what your religious views, though, let us know what you are thankful for this week! If you are in the United States, you are probably aware that the deadline for filing taxes is Monday, April 15th. Fortunately, the link-up for this blog hop is open until late Tuesday night, so get those taxes filed, then link up a blog post! We want to hear what you are thankful for this week! Thanksgiving can happen in April, when you're participating in the Ten Things of Thankful blog hop! Pull up a chair, and before we eat, let's go around the table and tell everyone what we are thankful for. Ready, set, go! From the sound of the wind blowing outside, March has an interesting definition of "going out like a lamb." I nearly hit a huge tumbleweed yesterday, which made me feel like I was back in the high desert of California. The lambs must be frolicking! No matter how the wind blows (or not) where you are, there are reasons to be thankful. Come join our blog hop and let us know your list! Ten Things of Thankful: Spring is Here! Are you as happy about spring as I am? Take a minute or two to share in the comments what makes you most thankful about this season. 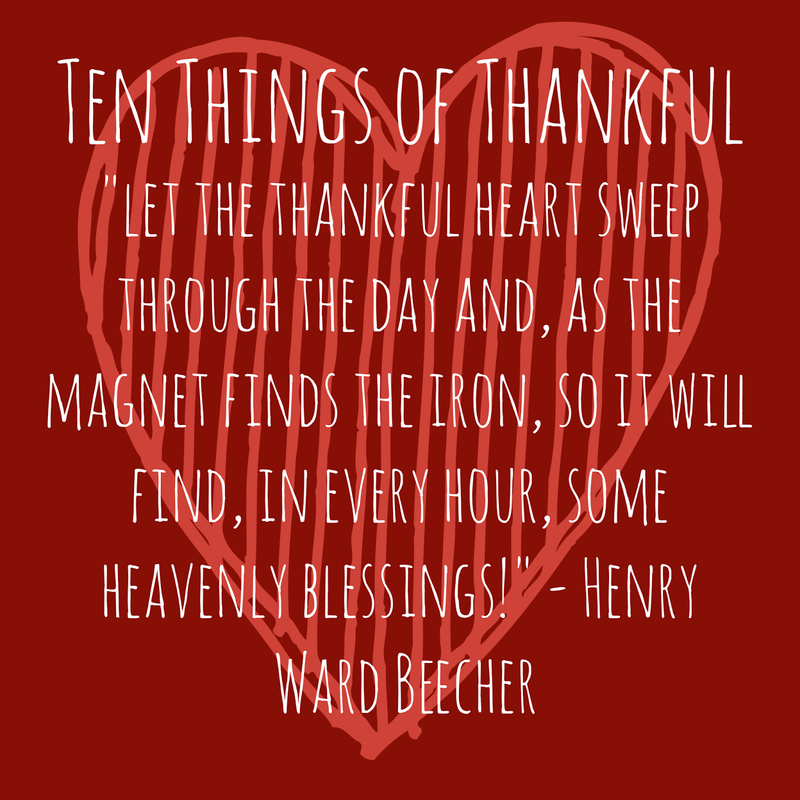 If you are a blogger, link up your own Ten Things of Thankful post! It's hard to believe it's already mid-March! Spring will be here soon, at least on the calendar, if not in the weather. What are you thankful for this week? Ten Things of Thankful: Spring Ahead! Photo: The sun sets under fluffy clouds. 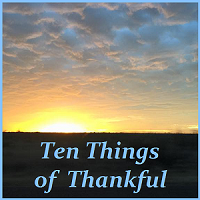 "Ten Things of Thankful" captions the photo. No matter what time it is, or what time it feels like, we can always be thankful. 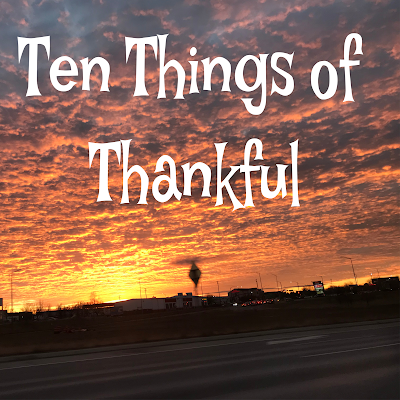 Photo: A beautiful orange sunset with the caption, "Ten Things of Thankful"
Valentine's Day, a long weekend, and a Ten Things of Thankful blog hop--hope you will come join the party! 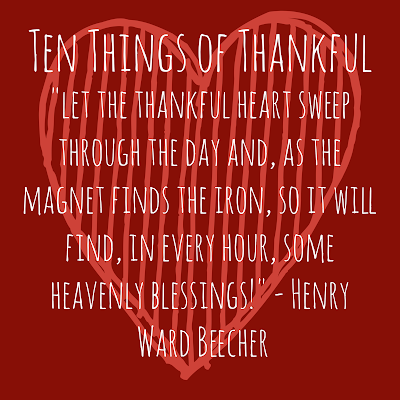 A red heart with the words, "Ten Things of Thankful 'Let the thankful heart sweep through the day and, as the magnet finds the iron, so it will find, in every hour, some heavenly blessings!' Henry Ward Beecher"
Punxsutawney Phil must have a sense of humor, if he is calling the current weather an "early spring." Whether the weather is warm or cold in your neck of the woods, I hope you can find things that bring you a sense of thankfulness. I'm looking forward to reading your posts! When you've had as much sledding and snow-angel-making as you can take, come in, grab a cup of hot chocolate, and join the Ten Things of Thankful party! Ten Things of Thankful: February is Here! Welcome to the shortest of months! 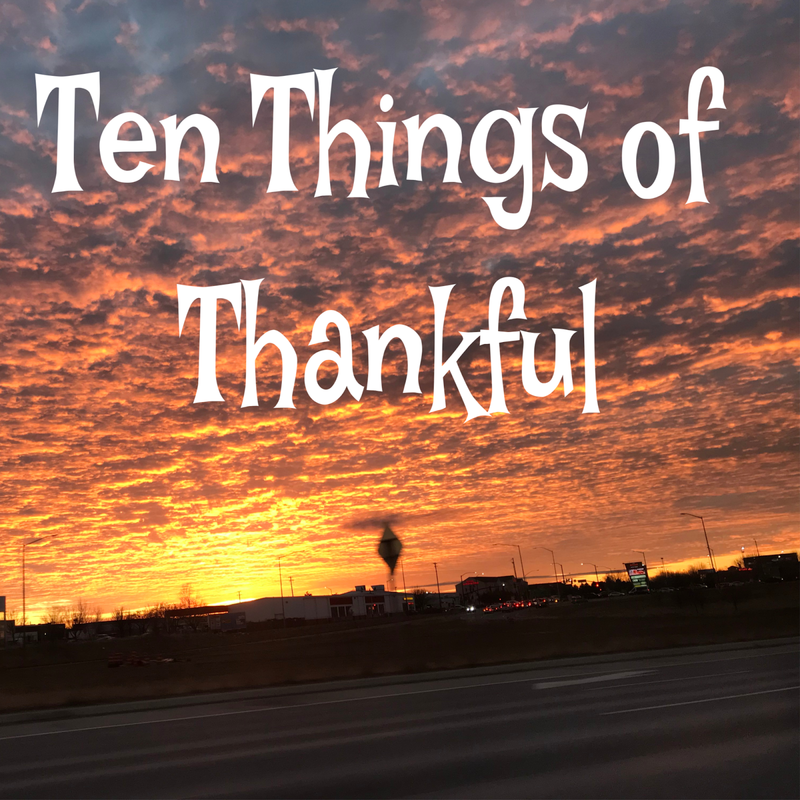 Come count to ten with us in this week of the Ten Things of Thankful! THANK YOU! (I scream in sincere gratitude.) You are the people who keep this blog hop going. Your expressions of thanksgiving are contagious, and help make life (online or irl) brighter. Thanks for joining us this week! I hope that wherever you are, you are warm and filled with things to be thankful for today. Let us know what those things are! How is 2019 going so far? Inside, my holiday decorations are put away, but outside, it still looks like Christmas. Mother Nature will have to take care of the snow and ice, but I will need to take the wreath and swags down soon--hopefully I'll get to it this weekend! Whether you are snowed in or enjoying balmy weather, I hope you can find something to be thankful for. 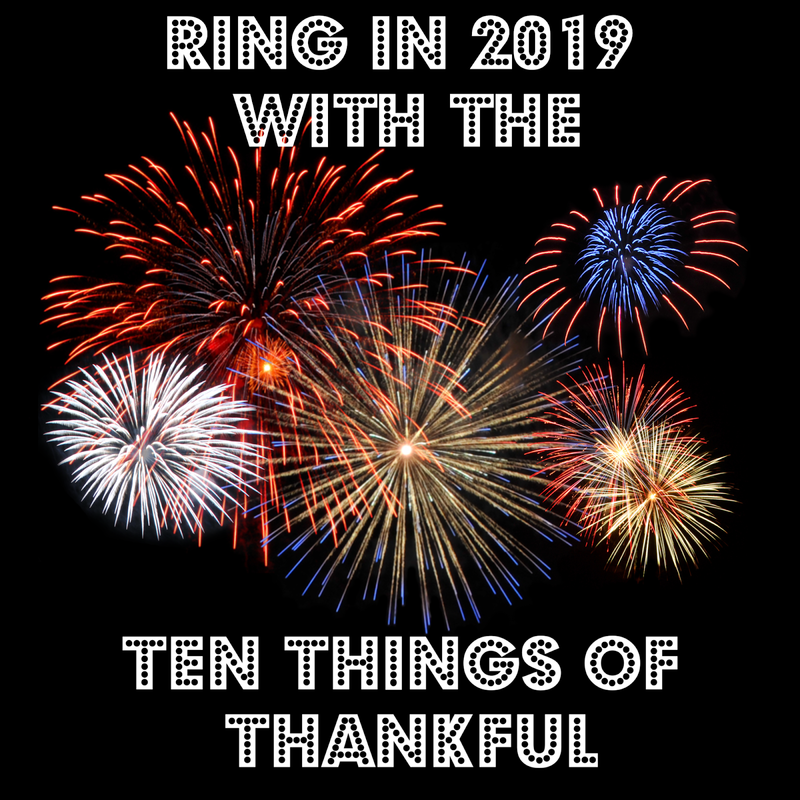 Ten Things of Thankful: Welcome 2019! A black background with fireworks and the caption, "Ring in 2019 with the Ten Things of Thankful"
After a two week break, our blog hop returns. I hope you had many reasons to be thankful as 2018 came to a close, and I hope you have many more reasons to be thankful in 2019. For those of you who have joined us in the past, thank you, and for those of you who are joining us in 2019, welcome! Let's make this year a year filled with gratitude!